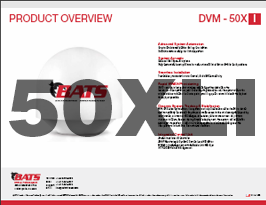 The DVM 50X is an enclosed microwave stabilization platform designed for configurations featuring up to 2FT antennas. Ideal for medium-duty deployments operating offshore, or in high wind environments, the DVM 50X represents a flexible solution for operators looking for reliable Line-of-Sight (LoS) communications in a protected enclosure. 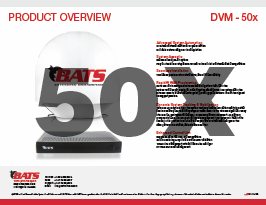 The DVM 50X System is a ruggedized, automated tracking and stabilization platform. 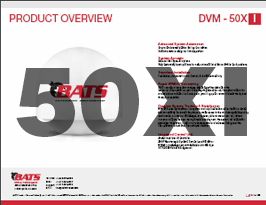 Positioned for antennas up to 2FT, the DVM 50X provides BATS’ tested medium payload, medium duty platform for organizations in need of a fixed, nomadic, or fully mobile broadband communication link. This enclosed, modular system is ideal for both fixed and mobile terrestrial and nautical applications. Where fixed, nomadic, or mobile point-to-point (PTP) communications is needed, operators will have the ability to quickly establish and configure high-speed, high-capacity wireless networks. Reach out to us at BATS to find how you can extend your broadband network!